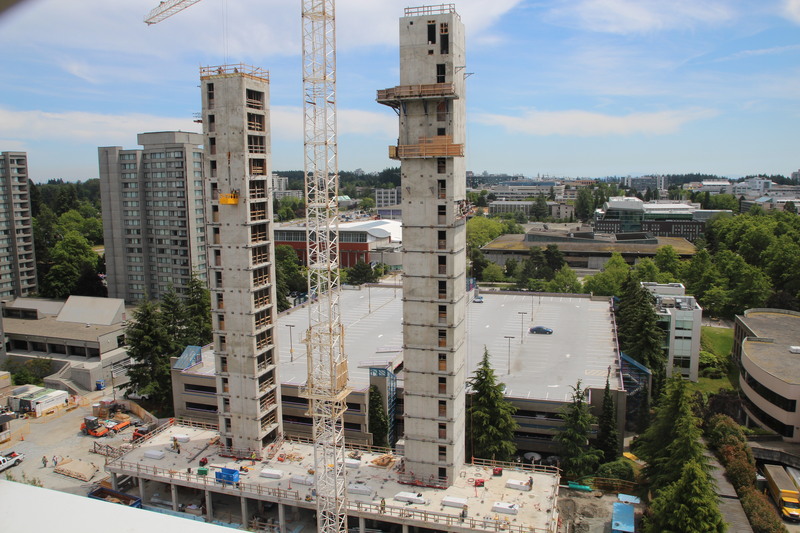 Construction of the 18-storey student residence at UBC is now underway. One of the tallest wood buildings in the world, Brock Commons will house 404 students in 272 studios and 33 four-bedroom units, and feature study and social gathering spaces. Earlier today I spoke with Oscar Faoro of the Canadian Tall Wood Structures Initiative, who confirmed the wood elements for this mass timber superstructure are just beginning to arrive. I look forward to learning more from Oscar when I visit the Education and Outreach Centre near the site. The centre was established by UBC to facilitate research and education opportunities during construction. We’re told here the centre will host group presentations and display information on the project, and will also be used for research purposes by UBC graduate students. The image below was downloaded from the Brock Commons webcam at UBC at 1:00pm this afternoon. Thanks also to Oscar for sharing these cool links to webcams at the Hines Minneapolis T3 Project and the Arbora/Nordic Montreal Project. At 7 storeys, it’s reported the T3 Minneapolis Office Building is the first modern tall wood building to be built in the United States. In Montreal, the 8-storey wood building will be the largest complex in the world built from mass timber. Oscar reports the tall wood projects in New York and Portland are presently in design development. This entry was posted in General Interest, Industry and tagged Softwood. Bookmark the permalink. Saw this on LinkedIn as well, very cool.